ONE and ONLY Dental Clinic in Thailand with international accreditations for both Dental Clinic and in-house Dental Lab. Bangkok Smile Dental Group (BSDG) is the one and only international accredited DENTAL CLINICS in Thailand for both scopes of DENTAL CLINIC SERVICE and DENTAL LAB. Thus, you can be assured that Bangkok Smile Dental Group is continuously providing the highest quality dental works with the utmost dental service ever. We are UKAS ISO 9001:2008 certified by Bureau Veritas international certification. 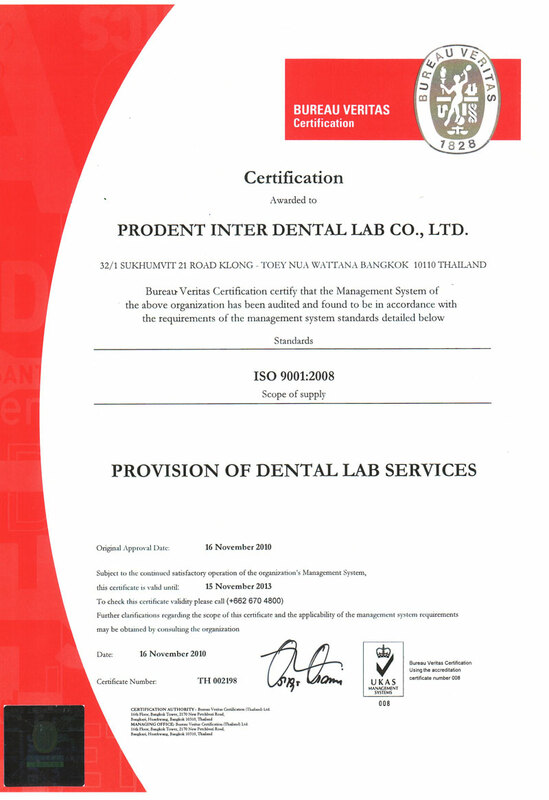 By our ISO 9001:2008 certified dental Lab, ProDent Inter Dental Lab Co.,Ltd., all crowns, bridges, veneers and dental implants are tailor-made for all of our dental clinics; 3 clinics in Bangkok and 3 clinics in Phuket. 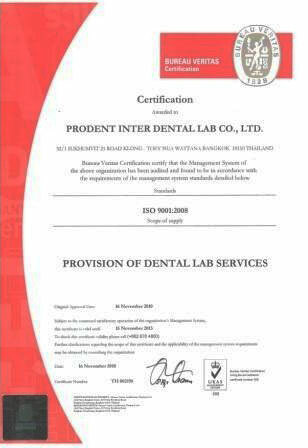 The management system of Prodent Inter Dental Lab Co., Ltd. is certified on IS0 9001:2008 quality standard as "PROVISION OF DENTAL LAB SERVICES". Management : The management of dental lab is under the total quality management ("TQM") methodology and implementation. That includes total work flow of dental work manufacturing, planning, processing, controlling, and evaluating. Inspection : All materials, work-in-process, and finished dental works are inspected in every process of manufacturing by the professional technicians at 100% inspection and under the quality control standard. Delivery : The finished dental works from our dental lab are scheduled at in-time delivery to our Bangkok and Phuket clinics. Speedy Service : Prodent Inter Dental Lab Co., Ltd. also provides the speedy services to our Bangkok and Phuket clinics. This service makes our patients assured that all dental treatments will be completely done even in the tight-scheduled trip. Trip Management : The certified management system of our dental lab makes us confident in all dental treatment plans to our patients who need the effective treatment plan on their dental trip itineraries to Thailand. The dental treatments are provided to each international patient within trip completely. The management system of Bangkok Smile Dental Group: Head Office and Bangkok Smile Dental Clinic, Ploenchit branch is certified on IS0 9001:2008 quality standard. 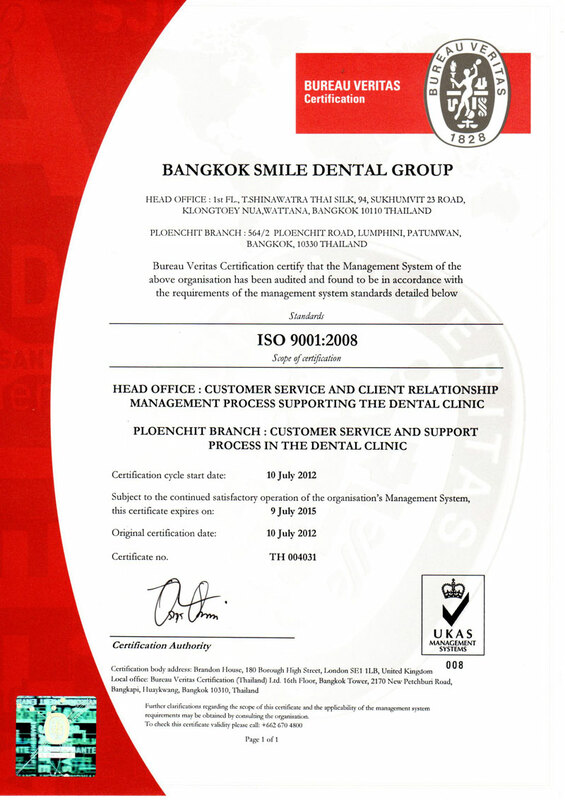 Bangkok Smile Dental Group: Head Office is certified for the scope of "CUSTOMER SERVICE AND CLIENT RELATIONSHIP MANAGEMENT SUPPORTING THE DENTAL CLINIC"
We practice the professional protocol and excel the system in responding incoming inquires in a timely manner. Important information such as dental treatments, treatment expenses, period of time needed and accommodations are neatly provided via email, prior to patient's departure. Through BSDG's in-house Intelligence Point of Service software (IPOS), patient's information; appointments, x-ray, dental records, including any special requests are recorded and transferred systematically from head office to dental clinic. We work on the same platform, from head office to clinic, therefore, each patient's unique requirements are treated properly from email to dental examination room. Bangkok Smile Dental Clinic, Ploenchit branch is certified for the scope of "CUSTOMER SERVICE AND SUPPORT PROCESS IN THE DENTAL CLINIC"
Sterilizations and Cleanliness: As a professional, our sterilization system is second to none. Routinely, we practice the hospital standards and sterilization techniques. Dental instruments and dental examination set are one time used and due to undergone full sterilization process. The standard is indicated by chemical integrator 3M Sterigage, Class 5. Dental instruments are stream autoclaved, packed, date produced and systematically stored and ready to be in service again. Dental Instrument Maintenance : All dental instruments are controlled and under inspection every 4 months by technicians in order to assure daily smooth operations and hygiene. Crowns / Bridges Porcelain Veneers For the broken or chipped porcelain crown or veneer, we will replace or repair the same type during these 2 years . You must keep the prescribed regular recall appointments (minimum 6 months) for routine professional exam, X-rays and Cleaning at our dental offices or your local dental offices. Composite Fillings. (Tooth Colored) If the composite restoration fails, we will replace or repair it for the period of 2 years from the placement date. You must keep the prescribed regular recall appointments (minimum 6 months) for routine professional exam, X-rays and Cleaning at our dental offices or your local dental offices. Dentures and Partial Dentures We will repair dentures and partials for a period of 3 years from the placement date, if a tooth chips, breaks or flange breaks undernormal use. This warranty will not apply to any accidents and dropping your dentures. You must keep the prescribed regular recall appointments (minimum 12 months) at our dental offices or your local dental offices.Patients with some of their own natural teeth must be seen at the prescribed recall appointments at our dental offices or your local dental offices. (Minimum 6 months) for routine professional exam, X-rays and Cleaning. Dental Implants There are two phases in dental implant treatment. The surgical phase and prosthetic phase. We will replace or repair the same type of any implant prosthetics at no extra charge to you during these 2 years. We will replace or repair the same type of any implant plastic/composite/PMMA teeth at no extra charge to you during these 6 months. You must keep the prescribed regular recall appointments (minimum 6 months) for routine professional exam, X-rays and Cleaning at our dental offices or your local dental offices. •	Refund is not part of what we guarantee. To invoke the guarantee you must contact our clinics immediately and before taking any other action. We do not reimburse overseas dental expenses made by other dentists back home post treatment nor do we reimburse travel and accommodation expenses traveling back for our warranty claims. •	We do not take responsibility for prior or continual dental works done by your dentists back home. The local warranty also does not cover damage of dental works caused by or related to other dentists work done post treatment.